Having joined Congress after hectic negotiations, cricketer-turned-politician Navjot Singh Sidhu today said he was a "born Congressman" who was coming back to his roots and would be ready to work under anybody appointed by the high command and contest from where the party wants him to. Sidhu refused to comment on who would be projected as the Chief Ministerial candidate in poll-bound Punjab. "Gehun khet mein aur beta pet mein aur aap byah ki baat kar rahe ho,(it is premature to talk about the issue)," the former BJP man said when asked whether he would like to be the Chief Ministerial candidate of the party. Congress has not declared a chief ministerial candidate and was contesting the polls under the leadership of Amarinder Singh. "In politics there are no ifs and buts. If my aunt has moustache I would have called her uncle," the cricketer turned entertainer said in remarks at the press conference which were replete with one-liners and wit. To another question, Sidhu said he was ready to work under anybody appointed by the Congress high command and would contest from anywhere the party wants him to fight from. "I am not here for (personal agenda) but for redemption of Punjab," he said while slamming the Badals, accusing the Chief Minister and Deputy Chief Minister of looting the state and making the prosperous state "a pauper". Without taking name of any BJP leader, he suggested that the machinations of "Manthra" (a maid in the epic Ramayana who convinces Queen Kaikeyi that the throne of Ayodhya was for her son Bharat) made him leave Amritsar which he represented in Lok Sabha for four terms. However, he did not reveal who played the role of "Manthra" in the BJP. Finance Minister Arun Jaitley had contested the Amritsar seat unsuccessfully in the last polls. 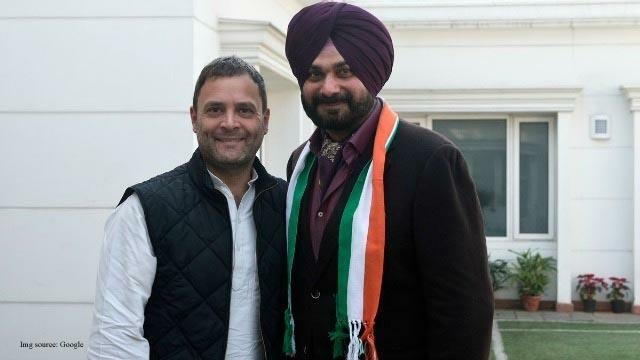 In his 30-minute press conference during which he was welcomed into the party fold by senior leader Ajay Maken and AICC secretary Asha Kumari, who is in-charge of party affairs in Punjab, Sidhu said that he left BJP as it "chose alliance" with Akali Dal while "I chose Punjab". Insisting that he was a "born Congressman", Sidhu said his father Bhagwant Singh Sidhu was a freedom fighter and was in the Congress for 40 long years and, therefore, "I have come back to my roots." Sidhu also described BJP as Kaikei, who sent Lord Rama to the jungle and Congress as Kaushalya who gave birth to the Lord. To a question, he said there were no differences with PCC Chief Amarinder Singh and added that when two nations can sort out their problems by sitting across the table why cannot two individuals resolve their differences. "If Lalu and Nitish can come together why can't I and Amarinder join hands," he asked. He sidestepped a question on his views about Prime Minister Narendra Modi. Sidhu also said that he has never spoken against former Prime Minister Manmohan Singh. The cricketer-turned-politician dismissed suggestions that he had taken time to join the Congress as he was busy in hard bargaining and that he had done likewise with the AAP earlier. He claimed that AAP leader Arvind Kejriwal himself tweeted that "I had no demands" and described him as an "icon". At the press conference, Sidhu after delivering dialogues, including some filmy ones, used his signature expression "khatak" meaning over-and-out which led to peels of laughter from reporters as well as those on the dais.